eMeals, online at emeals.com, is the easy way to plan your meals. eMeals is designed for people and families who crave healthy and delicious home-cooked meals without the planning. Customers simply sign up at eMeals and receive meal plans and recipes each week in their inbox, in addition to detailed grocery lists and weekly sales at select stores. eMeals takes care of meal planning, budgeting, and the grocery list, while members take credit for delicious meals. But before you start, get all the latest emeals.com discounts, eMeals promotions, and eMeals coupon codes found here at RetailSteal.com. Save 15% on eMeals any plan using this coupon code at emeals.com. Click here to begin. Shop Emeals.com and save 15% discount on your purchase with coupon code. Use this code at eMeals and enjoy a 15% discount on the leading meal planning system. Shop at eMeals and enjoy 5% savings on all orders. Click here for code. Shop at eMeals and enjoy $15 savings on orders $100+. Click here for code. Shop at eMeals and enjoy The Lunch Plan for only $4 a month. Click here for code. Try eMeals and get dinner subscriptions from just $5 per month. Click here to have dinner planned for you everyday. 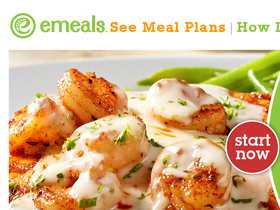 Enjoy a 20% discount on 12-month plans from eMeals online today when you enter our coupon code online. Whether you eat low carb, vegetarian, paleo, gluten free, organic, eMeals.com has meal plans which match your lifestyle and family size. Start today. Sign up at eMeals and have recipes, grocery lists, and deals at select stores sent to your inbox each week. Try it today.